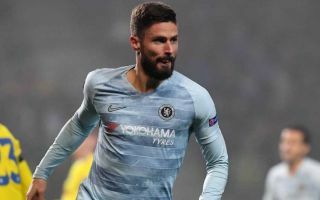 Chelsea striker Olivier Giroud has appeared to blame the intricate passing style deployed by manager Maurizio Sarri for his lengthy goal drought for the Blues. The France international scored for Chelsea for the first time since May in this evening’s Europa League win away to BATE Borisov, heading in a fine cross from Emerson Palmieri. This more direct approach certainly suits a tall player like Giroud who’s known for being good in the air, having scored a fair few headed goals like that throughout his career with Arsenal in the Premier League. It’s not been quite as easy for him at Chelsea with Sarri favouring a possession-based game built around small and skilful players like Eden Hazard and Pedro in attack. That means Giroud hasn’t perhaps had much service like this, but when asked about his goal after the game he dropped a little hint that he thinks CFC need to play direct like that a little more often. ‘I was hoping to score soon because I came back late from the World Cup and I was lacking maybe a bit of efficiency and luck but you always need to keep working hard and keep the faith and that’s what happened tonight,’ the ex-Gunner is quoted by the Metro. We imagine Sarri won’t agree with that, though of course every manager needs a Plan B occasionally, and Giroud is pretty much the perfect option to bring on from the bench if you want something a bit different after struggling to break a team down.